Exciting debut winner Endorsed takes the leap into G1 company for the Champagne Stakes over a mile on dirt at Belmont Park, USA, on Saturday, 6 October. 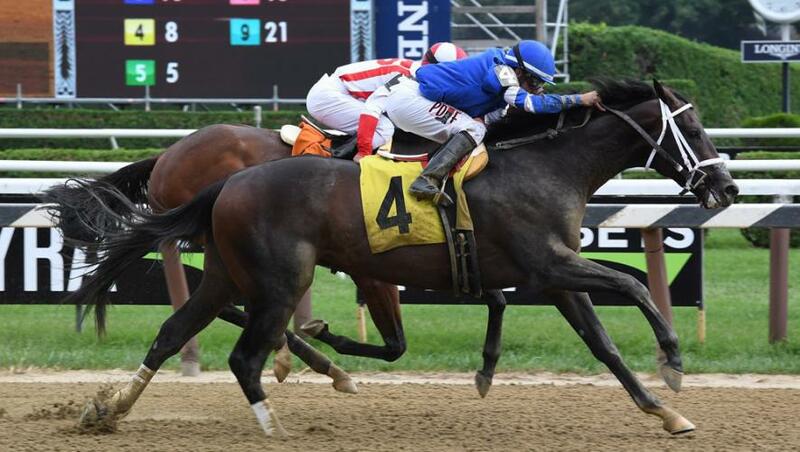 The two-year-old Medaglia d’Oro colt, who is out of Godolphin’s 2012 G1 Gazelle Stakes scorer Dance Card, made an impressive start to his career for trainer Kiaran McLaughlin when quickening strongly for a neck success in a six-furlong maiden at Saratoga on 18 August. Joe Bravo, in the saddle on that occasion, takes the ride again on Endorsed, who is drawn in stall one of 10-strong field which also features G2 Saratoga Special winner Call Paul plus Saratoga maiden winners Achilles Warrior, Complexity and Code Of Honor. Kiaran McLaughlin reported: “Endorsed is a nice colt, who is doing great. “It’s a big step up from a maiden to a G1, but it’s the same for the majority of the field as there are a lack of opportunities for two-year-olds. “Being drawn one doesn’t hurt us as it is a one-turn mile with a lot of pace on. We will hopefully be sitting fifth, sixth or seventh early on and it should work out fine.